As many as 67 candidates (36 per cent) have wealth above Rs 5 crore, while 44 candidates (24 per cent) possess assets to the tune of Rs 2-5 crore. 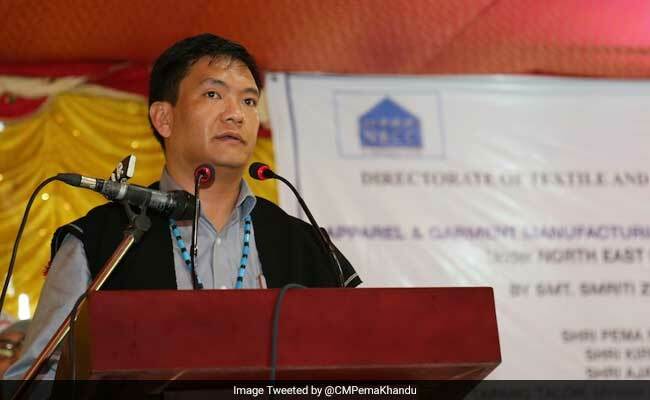 Arunachal Chief Minister Pema Khandu, who is seeking a re-election from Mukto Assembly seat for the third consecutive term, is the richest among 184 candidates contesting the state polls, with assets worth more than Rs 163 crore, according to an election watchdog report. Polling for simultaneous Lok Sabha and Assembly elections will be held in the state on April 11. A thorough analysis of the affidavits submitted before the election office found that 131 of 184 Assembly poll candidates are crorepatis, the report by Association for Democratic Reforms (ADR) said. As many as 67 candidates (36 per cent) have wealth above Rs 5 crore, while 44 candidates (24 per cent) possess assets to the tune of Rs 2-5 crore, it said. Mr Khandu, who defected to the BJP from the Congress in 2016, has movable assets worth Rs 1,43,87,82,786 and immovable assets worth Rs 19,62,75,356, as declared in his affidavit. Lombo Tayeng, the Congress candidate from Mebo constituency, is the second-richest candidate in the state with wealth of more than 148 crore - movable assets of Rs 1,13,52,21,594 and immovable assets of Rs 35,01,84,400. Another BJP candidate Tsering Tashi, who is contesting the polls from Tawang Assembly constituency, ranks third on the list with assets worth over 109 crore - movable assets of Rs 97,10,97,522 and immovable assets of Rs 12,32,96,250. The average assets of the candidates contesting the Assembly polls were recorded at Rs 9.86 crore, the election watchdog report stated. In the 2014 assembly elections, of the 148 candidates in the fray, 88 (60 per cent) were crorepatis. Among the major parties, the BJP leads the tally this time with 54 crorepatis, accounting for 90 per cent of its candidates in the fray. The opposition Congress has 30 crorepatis (65 per cent), while the National People''s Party (NPP), which is contesting the state polls for the first time, has 11 (73 per cent) crorepatis. Five of the eleven independents in the race have declared assets worth more than Rs 1 crore. Making an exception, Congress candidate from Tali assembly constituency has declared zero assets. Among those who were found to be possessing nominal assets is Janata Dal (Secular) candidate from Lekang constituency Takam Paleng, with Rs 5000. Another JD(S) nominee from Longding-Pumao constituency, Wangshu Wangsu, has declared assets worth Rs 75,365, while Congress candidate from Liromoba seat, Marjum Karbak, possesses wealth to the tune of Rs 1,20,000. The report added that none of the candidates have declared their ITR details, while two of them have not provided their Permanent Account Number. According to section 10(26) of IT Act, 1961, a Scheduled Tribe (ST) member residing in specific areas of Arunachal, Manipur, Mizoram, Nagaland, Tripura or Ladakh in Jammu and Kashmir is exempted from paying income tax. Barring one, all seats in the 60-member Assembly in Arunachal Pradesh are reserved for Scheduled Tribe. On the educational qualification front, the election watchdog reported that 108 candidates are graduates, while 68 of them have studied between Classes 5 and 12. Five candidates have been found to be illiterate. A total of 35 candidates have declared their age to be between 25 and 40 years, while 130 have mentioned their age between 41 and 60 years and 19 nominees have submitted their age between 61 to 80 years, the report added.